All you drama lovers can now watch out for the soon to be releases drama movie “Pride and Glory” in a nearby theater from October 24th, 2008. Distributed all over by Warner Bros. Pictures Distribution, this Hollywood movie has got a R for strong violence MPAA rating. “Pride and Glory” is a movie about four New York City cops who killed in an ambush. The whole drama revolves around this crime and murder mystery with a series of thrilling investigations and tragedies. Watch out how Detective Ray Tierney leads the investigation team and whether he succeeds or not in coming with the truth behind the murder mystery in the movie “Pride and Glory”. 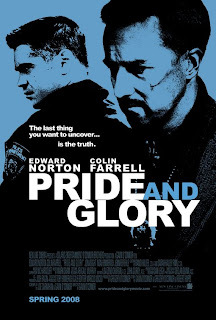 Directed by Gavin O Connor, “Pride and Glory” in its full 2 hour and 9 minutes duration won’t fail to impress you with its interesting storyline. “Pride and Glory” has been shot in the New York City itself. An honest, gripping drama.A muscular, old-school American film, with big themes splashed on a big canvas, "Pride and Glory" is familiar and original at the same time.Thanks for this nice blog.